Visiting Writer | Read it! Read it! We’re excited that Julie Gard, a BSC English faculty member from 2003-2007, is back as part of BSC’s Visiting Writers Series! Julie is in residence from March 2-4, and tonight (Monday, March 3), she will give a public reading from her work in the Basin Electric Auditorium (Room 304) at BSC’s National Energy Center of Excellence. Julie has a Masters of Fine Arts in creative writing from the University of Minnesota and spent a year in Russia as a Fulbright Graduate Fellow. 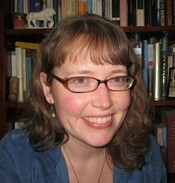 She now lives in Duluth, Minnesota, and is an assistant professor of writing at the Unviersity of Wisconsin-Superior. Her prose poems and stories have appeared in more than 30 literary magazines and anthologies. For a sampling of Julie’s writing, check out Obscura: the Daguerreotype Series: Prose Poems from the BSC Library collection. You can also find Julie Gard online at juliegard.com. The IPPY Awards, launched in 1996, are designed to bring increased recognition to the deserving but often unsung titles published by independent authors and publishers. Regional IPPY awards were launched in 2006. The winning books reflect their various regions and are judged solely against other books from the same region. 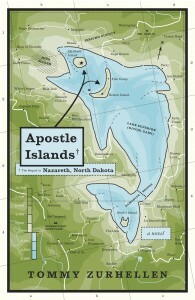 The 2013 winner in the “Great Lakes – Best Regional Fiction” category is a sequel to the book, Nazareth, North Dakota. Author Tommy Zurhellen visited our campus in the fall of 2011 as part of the BSC Visiting Writers Series. Check them both out at the BSC Library! What are the chances? That’s what Visiting Writer Melanie Hoffert asked in a wonderful essay (How I Broke My Chuck Klosterman Curse) that was published in Publishers Weekly (January 26, 2013). Melanie Hoffert grew up on a farm near Wyndmere and went to high school with Chuck Klosterman, another North Dakota author. What are the odds that two writers would spring from this tiny farming community? As a BSC Visiting Writer, Hoffert will be speaking and reading from her work on Thursday, March 21, at 8 p.m. in the National Energy Center of Excellence Basin Electric Auditorium 304. Don’t miss this event! We also have Hoffert’s new book at the BSC Library — Prairie Silence: a Memoir. Check it out! 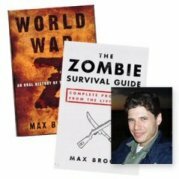 Author Max Brooks, son of Mel Brooks and Anne Bancroft, is completely dedicated to raising awareness on the issue of Zombie survival. His 2007 New York Times bestseller, World War Z: An Oral History of the Zombie War, soon to be made into a major motion picture starring Brad Pitt, tells the story of the world’s desperate battle against the zombie threat with a series of first-person accounts “as told to the author” by various characters around the world. Publishers Weekly called the novel “surprisingly hard to put down.” Brooks’ latest release, The Zombie Survival Guide: Recorded Attacks, is the graphic novel that fans demanded. Brooks worked for the BBC in Great Britain and East Africa and is a former writer for Saturday Night Live. He lives in New York City with his wife, Michelle, and their miniature dachshund, Maizey. Brooks will be at BSC on Wednesday, April 25, at noon to lead a “Dead Man Writing Class.” This will be a bring-your-own-lunch writing discussion in the Prairie Room, Student Union. This event is free and open to the public and is sponsored by BSC’s Visiting Writers Series and ArtsQuest. At 7:30 in the evening, Brooks will be at the Belle Mehus Auditorium presenting 10 Lessons to Survive a Zombie Attack. Brenda Marshall, author of Dakota, Or What’s a Heaven For, is in the building! Don’t miss the Visiting Writer reading tonight (Thursday, March 1) at 7:30 p.m., or the BookTalk at BSC discussion on Sunday, March 4, at 1 p.m.